A place in the Kingstone Press Championship top four is still a realistic target for Sheffield Eagles. With a four point gap to make up, director of rugby Mark Aston has set his sights on finishing amongst the division’s elite, but admits his side need to significantly up their game in the second half of what has so far been a disappointing campaign. That starts with the home showdown with Workington Town this Saturday, with Aston looking for his side to show the kind of performances which ensured they were a top four mainstay throughout the 2015 campaign. “I would hope now that we are at the half-way stage that we can start hitting our straps because we are not dead and buried out of the top four yet,” Aston exclaimed. “Most people thought that we would be out of it by now, but we are not because teams are continuing to beat each other. Workington have only won once this season, and the Eagles are expected to complete a double over Phil Veivers’ side. A victory could see the Eagles move within the cusp of their end of season target ahead of a gruelling set of fixtures, which are set to make or break their campaign. Whilst Aston has been flummoxed by the Eagles inconsistency this season, he has again taken heart from the second half display in their recent victory over Dewsbury. If his side were to back that up this Saturday it could lead to an interesting month, as the Eagles look to claw their way into middle eight contention. “You are hoping that it will click, but it is the players only who can make that happen now,” Aston added. 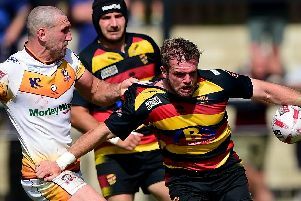 “We saw signs in that second half against Dewsbury, that is the sort of attitude and commitment that we are looking for because off the back of that we can score tries. There is no doubt that we can play, but we just haven’t been consistent. The Eagles will be keeping their fingers crossed over the fitness of winger Garry Low who has been given an injection on his troublesome shoulder injury.